Content provided courtesy of USAA. Used with permission. “I don’t want to go to Germ-uh-mee,” our four-year-old pouted as I placed my fingertip on the oddly shaped splotch of orange decorating the center of Europe on the world map that had commandeered our dining room table. Our son had suddenly become aware of just how far away our OCONUS duty station would be from our family and friends in Texas. Even though orders to Germany were a dream come true for my husband and me, it proved to be a scary and unwelcome change for our children — at first, anyway. 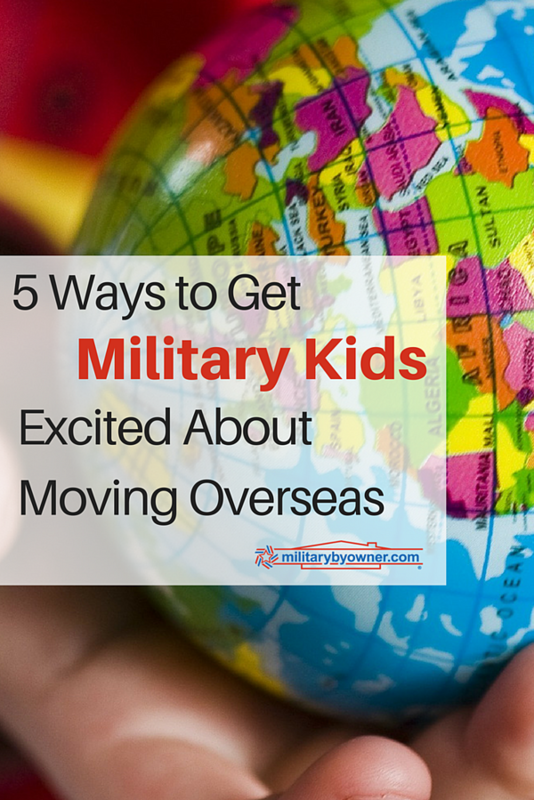 Getting less-than-thrilled military kids excited about moving overseas is a challenge, but it can be done. 1) Have a library scavenger hunt. As soon as you have hard copies of orders in hand, take a trip to the local library. Send your older kids on a scavenger hunt to find as many books and reference materials as they can about your new host nation. Meanwhile, help your little ones search for picture books with characters that live in or travel to the country. Reading about the OCONUS duty station will help both groups learn about the people, culture and customs in age-appropriate ways while also inspiring interest and enthusiasm. 2) Start learning the language together. Learning a new language can be one of the most intimidating challenges of moving overseas — but it can also be the most fun! Invest in a set of vocabulary flash cards to create your own memory game; listen to CDs in the car in between appointments and errands; watch language courses disguised as cartoons (like “Muzzy”) together; or download learning apps, such as “Duolingo,” to play on your smart phones or tablets. 3) Create a family travel bucket list. Have a family meeting and invite each child to contribute one destination to a travel bucket list. It can be a city, a theme park, the home arena of a favorite sports team — any place they’d like to go that will get them excited about experiencing your OCONUS duty station! Have a tablet, smart phone, or laptop handy so your kids can research opportunities with your supervision. For younger children, it may be a good idea to provide a short list of options they can choose from. Once you’ve decided on the list of places to visit, get creative and come up with a format (on a chalkboard or in a photo frame, for example) for displaying it in your new home overseas. Consider hosting a themed going away party before your to-do list gets out of hand. Share the music, flair, and flavors of your host nation with your family and friends. Plan a menu around regional dishes, download folk songs, and add finishing touches with traditional décor. Use the event as an opportunity to encourage your children to celebrate the relationships you’ve made and the experiences you’ve had together at your current duty station, while looking forward to starting a new chapter of life together overseas. 5) Treat the moving process like a vacation. Even though an OCONUS PCS is far from my idea of a relaxing get-away, it involves many key elements of family trips that kids love: exciting transportation experiences, spending the night in hotels, exploring new cities, and dining out. Research parks, unique activities for children, and family-friendly accommodations and restaurants your kids will look forward to visiting along the way. In between checking major items off your to-do list, make a plan to take time to relax, have fun and enjoy the journey together. You deserve it. Now that we’ve been in Germany for more than two years, our boys can’t imagine life back in the States. 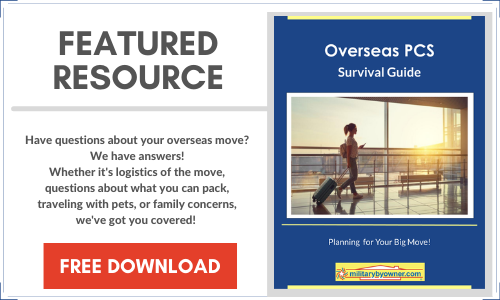 The transition was tough, but working together as a team to encourage excitement and stay positive proved to be helpful in our adjustment to life overseas. I’m hopeful that, one day, our military kids will look back on this unique experience with pride, appreciation, and lots of fond memories. Are you living overseas? How did you help your children adjust? Share your insights in the comments! Blogger bio: Courtney Woodruff is a military spouse, mom, writer, editor and web content manager currently living in Germany. She has a heart for our troops and their families and hopes to share what little she has learned along the way to help others overcome the unique challenges of military life. You can follow her adventures at her blog, Courtney At Home, or through her social media: Instagram, Facebook, Twitter, and Pinterest.